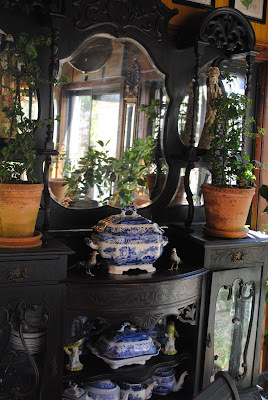 I love blue and white dishes and many of them reside in and on the sideboard in the breakfast room. The Spode serving pieces, pitchers and teapots as well as the cups and saucers. A perfect place for it is where I usually take my afternoon tea. And on top of the sideboard . . . a tureen. A Fitz and Floyd red and white tureen (whose twin lives with Cass at That Old House). 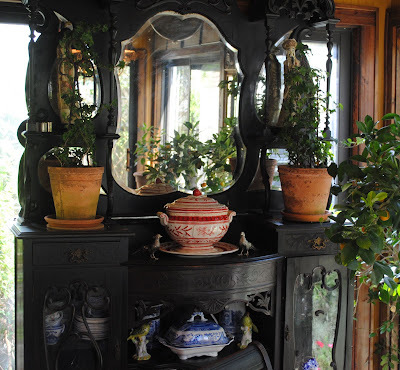 I love tureens and have a few others (a white ironstone one, a blue and white Asian one) but the red and white one was by far the classiest and thus deserved the place of honor on the breakfast room sideboard. But I've yearned for and wanted for a very long time, the Spode Blue Italian one. I coveted it but alas, could not justify just buying it -- just because I wanted it! And then I had knee surgery -- twice -- in two months. And I felt that I deserved a reward . . . and since I had saved some money during the summer since I didn't meet friends for lunch and didn't go shopping . . . . I was able to splurge and the long yearned for tureen became mine! The Spode tureen certainly looks better on the sideboard, methinks. It's an impressive piece and, to me, completes the sideboard. It is perfect!!!! And I am so glad that I finally bought my long wanted piece. Seeing it on the sideboard, I'm just sorry that I didn't buy it ages ago -- but it is mine now!!! It's Monday and I'm joining Sally for Blue Monday at Smiling Sally for my new tureen is blue and I'm joining Susan at Between Naps on the Porch for Met Monday for I think my new tureen really transforms my sideboard!!! If Oliver wakes up and barks in the middle of the night, and you go downstairs to discover an empty place where the Spode tureen once stood -- and your door is standing open -- it was not ME who burglarized Linderhof. I swear. No, really -- you SO deserve it after this summer; good girl. It's going to make you smile every time you look at it! Your new Spode tureen is the classiest yet! It really is the crown jewel of the sideboard. The sideboard, by the way, is a showpiece in itself! Yes, indeed, you truly deserve the gorgeous tureen. it is perfect on the sideboard--as if the space was just waiting to show it off. I hope Oliver can ward Cass off at the door!! I'm so pleased for you, the tureen is fantastic Martha - I know because I have one too! I'm finding it impossible to source a matching ladle though as they are now discontiued :o( I hope yours came with one. Mine did come with one!!! Your tureen is sooooooo gorgeous and very well deserved. Just stunning. Congratulations. I'm glad you put it in a prominent place. It deserves to be seen and cherished. Absolutely no doubt - that Spode tureen is exactly where it belongs. I always loved the red and white, but there is no contest. Of course, if you don't want the red and white anymore you can always let me know!! What a gorgeous piece to add to your exquisite collection! I'm so pleased that you spent a bit of luxury on yourself. You give so much of yourself to your family, community and to us in Blogland. . . I can't think of anyone more deserving of a bit of spoiling! I'll be watching for future post were the tureen is 'Star of the Show'. Do enjoy! Just beautiful, a true statement piece-congrats! Hi Martha! Oh, congratulations on your most gorgeous tureen! Poor little thing got all chopped up twice! You deserve this so much. I hope you got a chocolate milkshake too! LOL Love your gorgeous sideboard and how you've decorated it. Your new tureen is beautiful! But I so hate you had to go through two surgeries to reward yourself! Everything is just beautiful. Thank you for sharing! Yea! You finally got it! I love the way it looks in that perfect spot.... enjoy! You deserve it. Martha, it's beautiful and I am thrilled for you finally getting it. You did indeed deserve a reward! Your sideboard is GORGEOUS! Have you more pictures? I would love to see different angles...AND I love, love, love your new tureen! I agree the red and white was pretty but the blue and white doea finish everything off nicely. I'm so glad that you treated yourself, you certainly deserve it! Thanks again for sharing! This was a treat! I am very happy for you....wonderful! Blue and White is my favourite combination!! Enjoy!! Well, I would say that you deserved that awesome tureen. As one who has also had 2 TKA's, you earned that tureen the hard way. It beautiful and I can tell that spot was waiting for it's arrival. Welcome home Mr. or is it Mrs. Tureen. So glad you are doing exemplary Enjoy. Ginger. Your Spode Blue Italian tureen is gorgeous. It looks great on your lovely sideboard. Hope you are recovering well from your knee surgery. Love the sideboard! What a great piece of furniture. Fabulous and such a worth-while investment! I completely understand your logic...and agree with your decision. It is perfect on the sideboard and a great addition to the collection. I love your new blue and white tureen too! So gorgeous! I am glad you treated yourself. It is good to get what you want!!! Hope your knees are better. Lovely collection, the tureen is beautiful. Happy Blue Monday! Great photos - I love your blue things. Happy Blue Monday.